It’s the Roaring Twenties, and you and your friends are heading to the newest club in town. You heard it just opened, and it’s already the bee’s knees (fantastic). According to the latest chin music (gossip), there’s going to be a big blow (party) tonight, as long the bull (police) don’t find out and cast a kitten (throw a fit). So far, everything is Jake (a-okay), so you get yourself all dolled up (dressed up) in your glad rags (club clothes) and take a dimbox jaunt (taxi ride) to the club, ready for a nifty (great) time. Once you arrive, you notice there are plenty of skirts (gals) and fellas (guys) already zozzled (drunk), and a bunch more hoppers (dancers) out on the dance floor—though some of them are heelers (bad dancers), probably due to all the giggle water (booze) they’ve already consumed. There sure are some swanky (high class) looking folks here—gangsters, authors, politicians, even movie stars! You start to feel a little like a Rueben (backwards country bumpkin) as you watch high rollers throw clams (money) around like they were candy. But then you remember your Vintage Flapper Cigarette Holder. 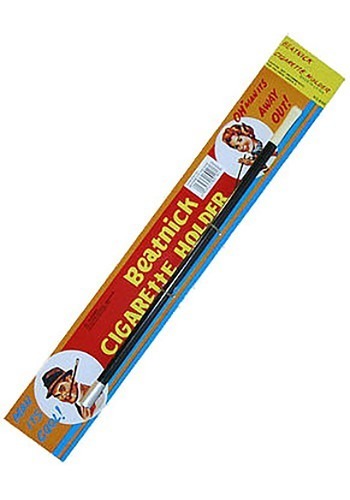 This 12-inch long holder will make you the most fashionable person at the party. Whether you’re rubbing elbows with F. Scott Fitzgerald or Clara Bow, you’ll never get upstaged as long as you’re holding your ciggy (cigarette) in this Vintage Flapper Cigarette Holder. It’s the cat’s meow!